A masterpiece of classical design. 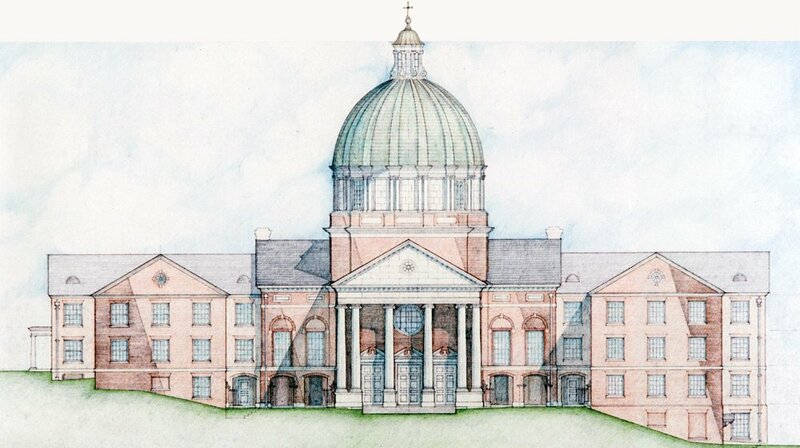 When Samford University approached the Davis team to renovate a dormitory into classrooms and offices and add a chapel for the Beeson Divinity School, they challenged us to design a facility that would be as inspiring architecturally as the institution’s mission and program. Furthermore, they wanted the chapel to be an instructive space that employed the symbolism, artistic expression, and liturgical architecture of its predecessors in the development of the reformed tradition. Compelled by the classical context of the Georgian Colonial campus, the team pursued a re-education in the principles, motifs and themes of classicist design. This study led to a recognition of the style’s many rules and an appreciation for the way in which the rules were permitted to be broken to further artistic expression, as evidenced by the styles renaissance and baroque masters. The chapel, similar in plan to Palladio’s Il Redentore, took on a more English character in keeping with the architectural style of the campus, budget constraints, and the reformation theology of the University. English plasterwork was a more appropriate finish to the interior spaces, rather than cut stone of its catholic predecessor. Instructively, the chapel is filled with literal and symbolic interpretations of the protestant faith as the four pendentives, with symbols of the gospels, support the dome painted with a “Cloud of Witnesses”. A large sculpture, designed by the design team, rises above the balcony and employs symbols of each of the Trinity in an equilateral relationship surrounding a tablet on which the Apostle’s Creed is carved. “God is in the Details” takes on new meaning with the Trinitarian themes of the three sides cube floor pattern and the triquetra inspired coffered ceiling medallions. The renovation of a forty-year-old dormitory into a new home for the Divinity School presented many problems. The Architect met the challenge of dealing with an existing structure, with typically eight foot three inch clear heights, by devising a system of thickened walls to deliver utilities and conditioned air to all the spaces from the attic above. Ducts, which had to run horizontally, were located along side concrete beams. Ceilings were then manipulated upward between beams to provide a more spacious feeling throughout. Space planning involved relationship issues as well as finding places for various functions to fir. Ground floor areas were excavated for tiered lecture rooms. Two, thirty-six foot by forty foot wings were added to the west where spaces requiring more openness were located. Third floor rooms were allowed to grow into attic spaces.